I am very happy to provide new information about the library that you helped fund in Mysore, India. We have received a report on the status of the project and I am telling you this is AWESOME. I will hand the microphone to Florence form the organisation Good Gifts. Good Gifts are in charge of all the practical stuff. 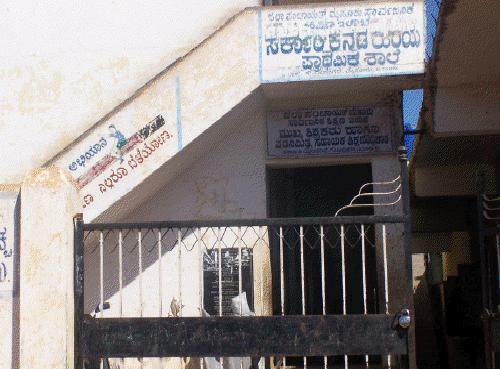 The Library funded by the Buy India a Library Project is being established in the Government Higher Primary School, in Gousiyanagare, Mysore district, Karnataka, southern India. The school has 820 pupils, from classes 1 to 10. Our partner in Mysore has been working since 1984 for the development of people living in slums, street children and child labourers. It reaches out to 50,000 people in 56 slums and 20 villages in Mysore, Mandya and Chamrajnagar districts. Its aim is to empower the marginalised poor to live a dignified life through collective action for regaining human rights and building sustainable community development. The library project took off from a humble beginning, procuring books and storing them in boxes in the absence of bookshelves. Books were also circulated among the poor people in slums, particularly to encourage parents to support their children’s reading. These modest steps were greeted with such enthusiasm that it was decided to expand the project to establish furnished libraries in government schools. The libraries are open to all of the pupils in the school. Each library holds around 2000 books, both fiction and reference books to help with school work and for wider learning. Children can use the reading rooms, as well as borrowing books to take home. After a year, in which the school will be given advice and training in book keeping and record maintenance, the library will be handed over to the school, so that they can continue to run the library successfully themselves. 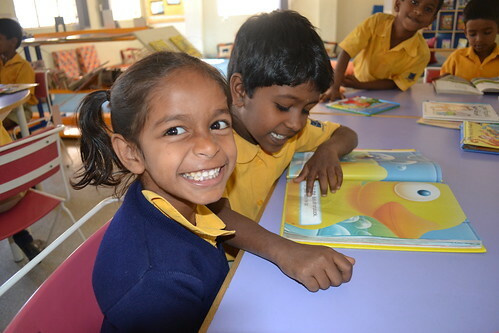 In India, people in the slums and villages have little opportunity for reading. Although there are public libraries in the district headquarters, these facilities are utilized by very few people, with only the highly educated or affluent class benefitting. Most of the children in slums and villages go to government schools. In principle, most government schools do not have library facilities. An exclusive place meant for books, with furniture for children to sit and read, is a rare sight in these schools. Even in the classroom, books are few and far between, and huge classes make it even harder for pupils to get their hands on them. Most parents are illilerate, so there is often little support for reading habits at home. There is therefore an urgent need to renovate and modify classrooms to provide facilities for a library space. Reading is essential for children. It helps them develop initiative, originality and character, as well as providing varied entertainment and invaluable knowledge. Reading also opens up new possibilities and instills good values, laying the foundation for a better tomorrow. The library project aims to address problems of lack of quality education in the government schools by developing reading habits among the children and thus widening their world of knowledge. Building rapport with school children, teachers, community members and SDMC (School Development and Monitoring Committee) members. Forming library committees comprising eight members including children in each of the selected schools and equipping with the knowledge to manage a library. Selecting schools in slums and villages based on the criteria of need and situation analysis. Each library will have an appointed coordinator who will monitor its function and ensure its proper use. They will also be responsible for organising various programmes to encourage the children’s reading habits. Ned’s presentation on Buy India a Library was featured on the front page of Slideshare today (!). I am so damn proud of him, and I trust Jan and Justin are too :). Ned also posted about this presentation on his blog. I also gave a talk about the project at TedX Princeton Library. And Jan did a poster session about it at the NextLibrary conference in Aarhus, Denmark in June. And who knows, maybe there will be more :). #buyalib HAS gone to the ball. And an additional £520 to make the library extra-awesome. Again, thank you more than words can say for your enthusiastic support of this project. We hope to be able to get pictures and reports about your libraries when they are up and running, and we’ll report about that here and on Twitter and the Facebook page. #buyalib SHALL go to the ball! Sorry we’ve taken so long to update this blog with a final total – we had one final donor to add to our total. That’s now all done, and the incredible news is between us we raised more than two-thousand, four-hundred pounds. More than enough to reach our target – getting on for twice as much, in fact! That means, more libraries in Africa, and a bigger library in India. Amazing. For more details, check out these Thank You slides. A very short update on what´s keeping the #buyalib team busy. We collected donations via a paypal account in the UK and one in USA. We are looking for cheapest way to transfer the US money to UK so we can get all the money to work for the library in India. We are working on how we get information from India through out the process to keep you informed about YOUR library via this blog. We are waiting on an answer that could give the project a last money boost – but nothing is sure yet. Last: Let me tell you that out donation status is £ 1920,82 – which is awesome. Thank you once again for your contributions and interest in our project. A brief update post. Thanks to some incredibly generous donations, we are now up to one thousand, three hundred and eighty-four pounds! This is enough to buy the permanent library in India we were aiming for, AND a mobile library in Africa! Thank you all so much for promoting and donating to this project. We’re finishing this on Friday, exactly two weeks after we started – amazing how much you can achieve collectively in a fortnight. So, if you still want to donate, make sure you get in there quick! In just one week, we have raised £750! That’s 60% of what we need to build a library in India. In other news, a lot of you have asked for more specifics about how and where the money will be spent, and we’ve contacted the charities involved with questions, so I hope to be able to share that information with you shortly. We remain amazed at your generosity and supportiveness: thank you. Thank you. Thank you. A short post to thank you for getting us more than half way towards our goal in a week. We now have the bricks but we still need someone to make them into a library and add books and librarians. Who spends the money we’re raising, and how? We want to provide some more detailed information about exactly what we’rre raising money for. People already know how we’re going to spend the money, but they want to know precisely who is spending it too. So, here’s some more info. The company through which we are buying these libraries is UK-based, and called GoodGifts.org. This is an online catalogue filled with philanthropic gifts, and it has achieved a huge amount – over 100,000 gifts have been given via the charity. Just imagine, all of those could have been book tokens… Instead, the work GoodGifts have done has given 150 villages fresh water where they had none before, helped 150,000 orphans through dowries, and 4,000 children have been given the gift of sight having previously been blind! It is the brain-child of the Charities Advisory Trust, a registered charity with more than 25 years of experience. What’s great about GoodGifts is that the money is guarenteed to be used for the specific purpose advertised – it doesn’t go into a general pot of cash, it is used specifically for what the customer chooses. So, via this campaign libraries will come into existence which were not in existence previously, thanks to your donation! GoodGifts charges a £4.95 handling fee on top of the cost of the gift – we (buyalib) will pay this fee, and the entirety of the money we raise will go directly to the charities involved. The donkey drawn libraries are delivered by the African Educational Trust a UK registered charity formed more than 50 years ago, dedicated to support education in Africa. The mobile libraries are aimed at kids, and contain around 100 fiction, non-fiction and reference books – the libraries travel to schools in Somalia, Sudan and Uganda (all of which are low on supplies of books, due to being former war zones). We’ve added a FAQ page to this blog, which talks about these issues and many more relating to the #buyalib project. If you have any other questions we’d be happy to answer them! In the meantime, if you can give any money at all, please use the Donate button below (the currency is £). Thank you very much. Do you want to know all about our project in less than two minutes? Watch this video where Andromeda Yelton shares the basic facts. The video was recorded by American Libraries Magazine at the ALA Mid Winter meeting in San Diego, USA and published here. Please help us by donating! The currency is in Pounds Sterling. Enter your email address to subscribe to this blog and receive notifications of new posts by email. We'll keep you up to date with how we're doing, and how we're spending the money. This is what we're aiming for… You can view more information on the library we want to buy for India, here.